Does Son have enough sunscreen to last him through the swim lesson, the soccer game, and the wait outside for pickup? Will he remember to drink enough water? Will he hurt his toes playing soccer in flipflops? Will he forget everything he learned in Kindergarten when first grade starts if we don’t read and write every day? Did the dog get enough exercise? Is he ever going to stop jumping on the counters. Is he too hot lying on the porch when it’s ninety degrees outside? Should we bring him in? Then we went on vacation to the Jersey shore for a week. What I love about our week together in a small rental house is that there’s less to worry about. Life is simple. And we made the smart move to leave six- month old Golden Retriever at home with my niece. I knew that if we brought him, I’d just worry about him cooped up in the cottage all day while we were at the beach, worry that he’d chew and ruin the owner’s things. Worry, worry, worry. Not so fast… I texted Niece on the third day. “I took him for a trail run and he’s doing great!” she wrote. Was he too tired? He’s never been for a run before! Was he too hot? Would he be okay? It took about a day, but I let it go. Five days into our trip, Daughter brought her Barbies to the beach and entertained herself by hurling Ariel into the waves. No fear. She’d throw her into the water and wait for Ariel to come rolling back to us. 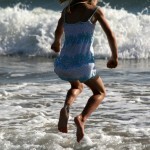 Daughter squealed and laughed and jumped the pounding surf as she raced around to catch her doll. Daughter stretched her arm up high and threw Ariel as far as she could into the water. I watched Ariel tumble under the froth and resurface at our feet. Yes, I see. Yes, I wish for the abandon of a four year old to trust that the elements will return what’s precious to us without any harm. To let others worry for her. But that’s my job – to worry. I’m the Chief Worry Officer.